Hier drucken wir einen Wipedia Beitrag zum strategischen Management in Englisch ab. "Business strategy" redirects here. For other uses, see business process. Strategic management provides overall direction to the enterprise and involves specifying the organization's objectives, developing policies and plans designed to achieve these objectives, and then allocating resources to implement the plans. Academics and practicing managers have developed numerous models and frameworks to assist in strategic decision making in the context of complex environments and competitive dynamics. Strategic management is not static in nature; the models often include a feedback loop to monitor execution and inform the next round of planning. Harvard Professor Michael Porter identifies three principles underlying strategy: creating a "unique and valuable [market] position", making trade-offs by choosing "what not to do", and creating "fit" by aligning company activities with one another to support the chosen strategy. Dr. Vladimir Kvint defines strategy as "a system of finding, formulating, and developing a doctrine that will ensure long-term success if followed faithfully." Corporate strategy involves answering a key question from a portfolio perspective: "What business should we be in?" Business strategy involves answering the question: "How shall we compete in this business?" In management theory and practice, a further distinction is often made between strategic management and operational management. Operational management is concerned primarily with improving efficiency and controlling costs within the boundaries set by the organization's strategy. Strategic management involves the formulation and implementation of the major goals and initiatives taken by a company's top management on behalf of owners, based on consideration of resources and an assessment of the internal and external environments in which the organization competes. Strategy is defined as "the determination of the basic long-term goals of an enterprise, and the adoption of courses of action and the allocation of resources necessary for carrying out these goals." Strategies are established to set direction, focus effort, define or clarify the organization, and provide consistency or guidance in response to the environment. Strategic management involves the related concepts of strategic planning and strategic thinking. Strategic planning is analytical in nature and refers to formalized procedures to produce the data and analyses used as inputs for strategic thinking, which synthesizes the data resulting in the strategy. Strategic planning may also refer to control mechanisms used to implement the strategy once it is determined. In other words, strategic planning happens around the strategic thinking or strategy making activity. Strategic management is often described as involving two major processes: formulation and implementation of strategy. While described sequentially below, in practice the two processes are iterative and each provides input for the other. Internal environment, regarding the strengths and weaknesses of the organization's resources (i.e., its people, processes and IT systems). Which businesses, products and services should be included or excluded from the portfolio of offerings? The answers to these and many other strategic questions result in the organization's strategy and a series of specific short-term and long-term goals or objectives and related measures. The second major process of strategic management is implementation, which involves decisions regarding how the organization's resources (i.e., people, process and IT systems) will be aligned and mobilized towards the objectives. Implementation results in how the organization's resources are structured (such as by product or service or geography), leadership arrangements, communication, incentives, and monitoring mechanisms to track progress towards objectives, among others. Running the day-to-day operations of the business is often referred to as "operations management" or specific terms for key departments or functions, such as "logistics management" or "marketing management," which take over once strategic management decisions are implemented. Michael Porter defined strategy in 1980 as the "...broad formula for how a business is going to compete, what its goals should be, and what policies will be needed to carry out those goals" and the "...combination of the ends (goals) for which the firm is striving and the means (policies) by which it is seeking to get there." He continued that: "The essence of formulating competitive strategy is relating a company to its environment." Peter Drucker was a prolific management theorist and author of dozens of management books, with a career spanning five decades. He addressed fundamental strategic questions in a 1954 book The Practice of Management writing: "...the first responsibility of top management is to ask the question 'what is our business?' and to make sure it is carefully studied and correctly answered." He wrote that the answer was determined by the customer. He recommended eight areas where objectives should be set, such as market standing, innovation, productivity, physical and financial resources, worker performance and attitude, profitability, manager performance and development, and public responsibility. In 1957, Philip Selznick initially used the term "distinctive competence" in referring to how the Navy was attempting to differentiate itself from the other services. He also formalized the idea of matching the organization's internal factors with external environmental circumstances. This core idea was developed further by Kenneth R. Andrews in 1963 into what we now call SWOT analysis, in which the strengths and weaknesses of the firm are assessed in light of the opportunities and threats in the business environment. "Strategy is the determination of the basic long-term goals of an enterprise, and the adoption of courses of action and the allocation of resources necessary for carrying out these goals." Igor Ansoff built on Chandler's work by adding concepts and inventing a vocabulary. He developed a grid that compared strategies for market penetration, product development, market development and horizontal and vertical integration and diversification. He felt that management could use the grid to systematically prepare for the future. In his 1965 classic Corporate Strategy, he developed gap analysis to clarify the gap between the current reality and the goals and to develop what he called “gap reducing actions”. Ansoff wrote that strategic management had three parts: strategic planning; the skill of a firm in converting its plans into reality; and the skill of a firm in managing its own internal resistance to change. Bruce Henderson, founder of the Boston Consulting Group, wrote about the concept of the experience curve in 1968, following initial work begun in 1965. The experience curve refers to a hypothesis that unit production costs decline by 20-30% every time cumulative production doubles. This supported the argument for achieving higher market share and economies of scale. Porter wrote in 1980 that companies have to make choices about their scope and the type of competitive advantage they seek to achieve, whether lower cost or differentiation. The idea of strategy targeting particular industries and customers (i.e., competitive positions) with a differentiated offering was a departure from the experience-curve influenced strategy paradigm, which was focused on larger scale and lower cost. Porter revised the strategy paradigm again in 1985, writing that superior performance of the processes and activities performed by organizations as part of their value chain is the foundation of competitive advantage, thereby outlining a process view of strategy. The direction of strategic research also paralleled a major paradigm shift in how companies competed, specifically a shift from the production focus to market focus. The prevailing concept in strategy up to the 1950s was to create a product of high technical quality. If you created a product that worked well and was durable, it was assumed you would have no difficulty profiting. This was called the production orientation. Henry Ford famously said of the Model T car: "Any customer can have a car painted any color that he wants, so long as it is black." Management theorist Peter F Drucker wrote in 1954 that it was the customer who defined what business the organization was in. In 1960 Theodore Levitt argued that instead of producing products then trying to sell them to the customer, businesses should start with the customer, find out what they wanted, and then produce it for them. The fallacy of the production orientation was also referred to as marketing myopia in an article of the same name by Levitt. Over time, the customer became the driving force behind all strategic business decisions. This marketing concept, in the decades since its introduction, has been reformulated and repackaged under names including market orientation, customer orientation, customer intimacy, customer focus, customer-driven and market focus. What can we be best in the world at? Involves both conceptual and analytical thought processes. Linear strategy: A planned determination of goals, initiatives, and allocation of resources, along the lines of the Chandler definition above. This is most consistent with strategic planning approaches and may have a long planning horizon. The strategist "deals with" the environment but it is not the central concern. Adaptive strategy: In this model, the organization's goals and activities are primarily concerned with adaptation to the environment, analogous to a biological organism. The need for continuous adaption reduces or eliminates the planning window. There is more focus on means (resource mobilization to address the environment) rather than ends (goals). Strategy is less centralized than in the linear model. Interpretive strategy: A more recent and less developed model than the linear and adaptive models, interpretive strategy is concerned with "orienting metaphors constructed for the purpose of conceptualizing and guiding individual attitudes or organizational participants." The aim of interpretive strategy is legitimacy or credibility in the mind of stakeholders. It places emphasis on symbols and language to influence the minds of customers, rather than the physical product of the organization. The progress of strategy since 1960 can be charted by a variety of frameworks and concepts introduced by management consultants and academics. These reflect an increased focus on cost, competition and customers. These "3 Cs" were illuminated by much more robust empirical analysis at ever-more granular levels of detail, as industries and organizations were disaggregated into business units, activities, processes, and individuals in a search for sources of competitive advantage. By the 1960s, the capstone business policy course at the Harvard Business School included the concept of matching the distinctive competence of a company (its strengths and weaknesses) with its environment (opportunities and threats) in the context of its objectives. This framework came to be known by the acronym SWOT and was "a major step forward in bringing explicitly competitive thinking to bear on questions of strategy." Kenneth R. Andrews helped popularize the framework via a 1963 conference and it remains commonly used in practice. 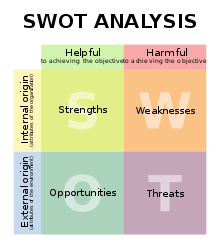 A SWOT analysis is an organized design method used to evaluate the strengths, weaknesses, opportunities and threats complex within the person or the group or the organization where the functional process takes place. An increased focus on empirical analysis of costs and processes, a concept which author Kiechel refers to as "Greater Taylorism." Kiechel wrote in 2010: "The experience curve was, simply, the most important concept in launching the strategy revolution...with the experience curve, the strategy revolution began to insinuate an acute awareness of competition into the corporate consciousness." Prior to the 1960s, the word competition rarely appeared in the most prominent management literature; U.S. companies then faced considerably less competition and did not focus on performance relative to peers. Further, the experience curve provided a basis for the retail sale of business ideas, helping drive the management consulting industry. Portfolio theory: A strategy based primarily on diversification through acquisition. The corporation shifts resources among the units and monitors the performance of each business unit and its leaders. Each unit generally runs autonomously, with limited interference from the corporate center provided goals are met. Restructuring: The corporate office acquires then actively intervenes in a business where it detects potential, often by replacing management and implementing a new business strategy. Transferring skills: Important managerial skills and organizational capability are essentially spread to multiple businesses. The skills must be necessary to competitive advantage. Sharing activities: Ability of the combined corporation to leverage centralized functions, such as sales, finance, etc. thereby reducing costs. Other techniques were developed to analyze the relationships between elements in a portfolio. The growth-share matrix, a part of B.C.G. Analysis, was followed by G.E. multi factoral model, developed by General Electric. Companies continued to diversify as conglomerates until the 1980s, when deregulation and a less restrictive anti-trust environment led to the view that a portfolio of operating divisions in different industries was worth more as many independent companies, leading to the breakup of many conglomerates. While the popularity of portfolio theory has waxed and waned, the key dimensions considered (industry attractiveness and competitive position) remain central to strategy. In 1980, Porter defined the two types of competitive advantage an organization can achieve relative to its rivals: lower cost or differentiation. This advantage derives from attribute(s) that allow an organization to outperform its competition, such as superior market position, skills, or resources. In Porter's view, strategic management should be concerned with building and sustaining competitive advantage. Porter developed a framework for analyzing the profitability of industries and how those profits are divided among the participants in 1980. In five forces analysis he identified the forces that shape the industry structure or environment. The framework involves the bargaining power of buyers and suppliers, the threat of new entrants, the availability of substitute products, and the competitive rivalry of firms in the industry. These forces affect the organization's ability to raise its prices as well as the costs of inputs (such as raw materials) for its processes. The five forces framework helps describe how a firm can use these forces to obtain a sustainable competitive advantage, either lower cost or differentiation. Companies can maximize their profitability by competing in industries with favorable structure. Competitors can take steps to grow the overall profitability of the industry, or to take profit away from other parts of the industry structure. Porter modified Chandler's dictum about structure following strategy by introducing a second level of structure: while organizational structure follows strategy, it in turn follows industry structure. Porter wrote in 1980 that strategy target either cost leadership, differentiation, or focus. These are known as Porter's three generic strategies and can be applied to any size or form of business. Porter claimed that a company must only choose one of the three or risk that the business would waste precious resources. Porter's generic strategies detail the interaction between cost minimization strategies, product differentiation strategies, and market focus strategies. Porter described an industry as having multiple segments that can be targeted by a firm. The breadth of its targeting refers to the competitive scope of the business. Porter defined two types of competitive advantage: lower cost or differentiation relative to its rivals. Achieving competitive advantage results from a firm's ability to cope with the five forces better than its rivals. Porter wrote: "[A]chieving competitive advantage requires a firm to make a choice...about the type of competitive advantage it seeks to attain and the scope within which it will attain it." He also wrote: "The two basic types of competitive advantage [differentiation and lower cost] combined with the scope of activities for which a firm seeks to achieve them lead to three generic strategies for achieving above average performance in an industry: cost leadership, differentiation and focus. The focus strategy has two variants, cost focus and differentiation focus." The concept of choice was a different perspective on strategy, as the 1970s paradigm was the pursuit of market share (size and scale) influenced by the experience curve. Companies that pursued the highest market share position to achieve cost advantages fit under Porter's cost leadership generic strategy, but the concept of choice regarding differentiation and focus represented a new perspective. Porter's 1985 description of the value chain refers to the chain of activities (processes or collections of processes) that an organization performs in order to deliver a valuable product or service for the market. These include functions such as inbound logistics, operations, outbound logistics, marketing and sales, and service, supported by systems and technology infrastructure. By aligning the various activities in its value chain with the organization's strategy in a coherent way, a firm can achieve a competitive advantage. Porter also wrote that strategy is an internally consistent configuration of activities that differentiates a firm from its rivals. A robust competitive position cumulates from many activities which should fit coherently together. Porter wrote in 1985: "Competitive advantage cannot be understood by looking at a firm as a whole. It stems from the many discrete activities a firm performs in designing, producing, marketing, delivering and supporting its product. Each of these activities can contribute to a firm's relative cost position and create a basis for differentiation...the value chain disaggregates a firm into its strategically relevant activities in order to understand the behavior of costs and the existing and potential sources of differentiation." Gary Hamel and C. K. Prahalad described the idea of core competency in 1990, the idea that each organization has some capability in which it excels and that the business should focus on opportunities in that area, letting others go or outsourcing them. Further, core competency is difficult to duplicate, as it involves the skills and coordination of people across a variety of functional areas or processes used to deliver value to customers. By outsourcing, companies expanded the concept of the value chain, with some elements within the entity and others without. Core competency is part of a branch of strategy called the resource-based view of the firm, which postulates that if activities are strategic as indicated by the value chain, then the organization's capabilities and ability to learn or adapt are also strategic. Peter Drucker wrote in 1994 about the “Theory of the Business,” which represents the key assumptions underlying a firm's strategy. These assumptions are in three categories: a) the external environment, including society, market, customer, and technology; b) the mission of the organization; and c) the core competencies needed to accomplish the mission. He continued that a valid theory of the business has four specifications: 1) assumptions about the environment, mission, and core competencies must fit reality; 2) the assumptions in all three areas have to fit one another; 3) the theory of the business must be known and understood throughout the organization; and 4) the theory of the business has to be tested constantly. He wrote that organizations get into trouble when the assumptions representing the theory of the business no longer fit reality. He used an example of retail department stores, where their theory of the business assumed that people who could afford to shop in department stores would do so. However, many shoppers abandoned department stores in favor of specialty retailers (often located outside of malls) when time became the primary factor in the shopping destination rather than income. Drucker described the theory of the business as a "hypothesis" and a "discipline." He advocated building in systematic diagnostics, monitoring and testing of the assumptions comprising the theory of the business to maintain competitiveness. Strategic thinking involves the generation and application of unique business insights to opportunities intended to create competitive advantage for a firm or organization. It involves challenging the assumptions underlying the organization's strategy and value proposition. 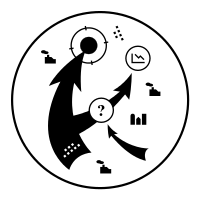 Mintzberg wrote in 1994 that it is more about synthesis (i.e., "connecting the dots") than analysis (i.e., "finding the dots"). It is about "capturing what the manager learns from all sources (both the soft insights from his or her personal experiences and the experiences of others throughout the organization and the hard data from market research and the like) and then synthesizing that learning into a vision of the direction that the business should pursue." Mintzberg argued that strategic thinking is the critical part of formulating strategy, more so than strategic planning exercises. General Andre Beaufre wrote in 1963 that strategic thinking "is a mental process, at once abstract and rational, which must be capable of synthesizing both psychological and material data. The strategist must have a great capacity for both analysis and synthesis; analysis is necessary to assemble the data on which he makes his diagnosis, synthesis in order to produce from these data the diagnosis itself--and the diagnosis in fact amounts to a choice between alternative courses of action." Strategic planning is a means of administering the formulation and implementation of strategy. Strategic planning is analytical in nature and refers to formalized procedures to produce the data and analyses used as inputs for strategic thinking, which synthesizes the data resulting in the strategy. Strategic planning may also refer to control mechanisms used to implement the strategy once it is determined. In other words, strategic planning happens around the strategy formation process. The first two elements relate to factors internal to the company (i.e., the internal environment), while the latter two relate to factors external to the company (i.e., the external environment). External environment: PEST analysis or STEEP analysis is a framework used to examine the remote external environmental factors that can affect the organization, such as political, economic, social/demographic, and technological. Common variations include SLEPT, PESTLE, STEEPLE, and STEER analysis, each of which incorporates slightly different emphases. Industry environment: The Porter Five Forces Analysis framework helps to determine the competitive rivalry and therefore attractiveness of a market. It is used to help determine the portfolio of offerings the organization will provide and in which markets. Relationship of internal and external environment: SWOT analysis is one of the most basic and widely used frameworks, which examines both internal elements of the organization — Strengths and Weaknesses — and external elements — Opportunities and Threats. It helps examine the organization's resources in the context of its environment. Once the strategy is determined, various goals and measures may be established to chart a course for the organization, measure performance and control implementation of the strategy. Tools such as the balanced scorecard and strategy maps help crystallize the strategy, by relating key measures of success and performance to the strategy. These tools measure financial, marketing, production, organizational development, and innovation measures to achieve a 'balanced' perspective. Advances in information technology and data availability enable the gathering of more information about performance, allowing managers to take a much more analytical view of their business than before. Strategy may also be organized as a series of "initiatives" or "programs", each of which comprises one or more projects. Various monitoring and feedback mechanisms may also be established, such as regular meetings between divisional and corporate management to control implementation. A key component to strategic management which is often overlooked when planning is evaluation. There are many ways to evaluate whether or not strategic priorities and plans have been achieved, one such method is Robert Stake's Responsive Evaluation. Responsive evaluation provides a naturalistic and humanistic approach to program evaluation. In expanding beyond the goal-oriented or pre-ordinate evaluation design, responsive evaluation takes into consideration the program’s background (history), conditions, and transactions among stakeholders. It is largely emergent, the design unfolds as contact is made with stakeholders. While strategies are established to set direction, focus effort, define or clarify the organization, and provide consistency or guidance in response to the environment, these very elements also mean that certain signals are excluded from consideration or de-emphasized. Mintzberg wrote in 1987: "Strategy is a categorizing scheme by which incoming stimuli can be ordered and dispatched." Since a strategy orients the organization in a particular manner or direction, that direction may not effectively match the environment, initially (if a bad strategy) or over time as circumstances change. As such, Mintzberg continued, "Strategy [once established] is a force that resists change, not encourages it." Therefore, a critique of strategic management is that it can overly constrain managerial discretion in a dynamic environment. "How can individuals, organizations and societies cope as well as possible with ... issues too complex to be fully understood, given the fact that actions initiated on the basis of inadequate understanding may lead to significant regret?" Some theorists insist on an iterative approach, considering in turn objectives, implementation and resources. I.e., a "...repetitive learning cycle [rather than] a linear progression towards a clearly defined final destination." Strategies must be able to adjust during implementation because "humans rarely can proceed satisfactorily except by learning from experience; and modest probes, serially modified on the basis of feedback, usually are the best method for such learning." In 2000, Gary Hamel coined the term strategic convergence to explain the limited scope of the strategies being used by rivals in greatly differing circumstances. He lamented that successful strategies are imitated by firms that do not understand that for a strategy to work, it must account for the specifics of each situation. Woodhouse and Collingridge claim that the essence of being “strategic” lies in a capacity for "intelligent trial-and error" rather than strict adherence to finely honed strategic plans. Strategy should be seen as laying out the general path rather than precise steps. Means are as likely to determine ends as ends are to determine means. The objectives that an organization might wish to pursue are limited by the range of feasible approaches to implementation. (There will usually be only a small number of approaches that will not only be technically and administratively possible, but also satisfactory to the full range of organizational stakeholders.) In turn, the range of feasible implementation approaches is determined by the availability of resources. Various strategic approaches used across industries (themes) have arisen over the years. These include the shift from product-driven demand to customer- or marketing-driven demand (described above), the increased use of self-service approaches to lower cost, changes in the value chain or corporate structure due to globalization (e.g., off-shoring of production and assembly), and the internet. Self-checkout at the grocery store. One definition of globalization refers to the integration of economies due to technology and supply chain process innovation. Companies are no longer required to be vertically integrated (i.e., designing, producing, assembling, and selling their products). In other words, the value chain for a company's product may no longer be entirely within one firm; several entities comprising a virtual firm may exist to fulfill the customer requirement. For example, some companies have chosen to outsource production to third parties, retaining only design and sales functions inside their organization. The internet has dramatically empowered consumers and enabled buyers and sellers to come together with drastically reduced transaction and intermediary costs, creating much more robust marketplaces for the purchase and sale of goods and services. Examples include online auction sites, internet dating services, and internet book sellers. In many industries, the internet has dramatically altered the competitive landscape. Services that used to be provided within one entity (e.g., a car dealership providing financing and pricing information) are now provided by third parties. Author Phillip Evans said in 2013 that networks are challenging traditional hierarchies. Value chains may also be breaking up ("deconstructing") where information aspects can be separated from functional activity. Data that is readily available for free or very low cost makes it harder for information-based, vertically integrated businesses to remain intact. Evans said: "The basic story here is that what used to be vertically integrated, oligopolistic competition among essentially similar kinds of competitors is evolving, by one means or another, from a vertical structure to a horizontal one. Why is that happening? It's happening because transaction costs are plummeting and because scale is polarizing. The plummeting of transaction costs weakens the glue that holds value chains together, and allows them to separate." He used Wikipedia as an example of a network that has challenged the traditional encyclopedia business model. Evans predicts the emergence of a new form of industrial organization called a "stack", analogous to a technology stack, in which competitors rely on a common platform of inputs (services or information), essentially layering the remaining competing parts of their value chains on top of this common platform. People can continuously expand their capacity to learn and be productive. New patterns of thinking are nurtured. People are encouraged to see the “whole picture” together. In 1978, Derek F. Abell (Abell, D. 1978) described "strategic windows" and stressed the importance of the timing (both entrance and exit) of any given strategy. This led some strategic planners to build planned obsolescence into their strategies. In 1983, Noel Tichy wrote that because we are all beings of habit we tend to repeat what we are comfortable with. He wrote that this is a trap that constrains our creativity, prevents us from exploring new ideas, and hampers our dealing with the full complexity of new issues. He developed a systematic method of dealing with change that involved looking at any new issue from three angles: technical and production, political and resource allocation, and corporate culture. In 1990, Richard Pascale wrote that relentless change requires that businesses continuously reinvent themselves. His famous maxim is “Nothing fails like success” by which he means that what was a strength yesterday becomes the root of weakness today, We tend to depend on what worked yesterday and refuse to let go of what worked so well for us in the past. Prevailing strategies become self-confirming. To avoid this trap, businesses must stimulate a spirit of inquiry and healthy debate. They must encourage a creative process of self-renewal based on constructive conflict. In 1999, Constantinos Markides reexamined the nature of strategic planning. He described strategy formation and implementation as an ongoing, never-ending, integrated process requiring continuous reassessment and reformation. Strategic management is planned and emergent, dynamic and interactive. The search for best practices is also called benchmarking. This involves determining where you need to improve, finding an organization that is exceptional in this area, then studying the company and applying its best practices in your firm. In 2010, IBM released a study summarizing three conclusions of 1500 CEOs around the world: 1) complexity is escalating, 2) enterprises are not equipped to cope with this complexity, and 3) creativity is now the single most important leadership competency. IBM said that it is needed in all aspects of leadership, including strategic thinking and planning. Dr Maretha Prinsloo developed the Cognitive Process Profile (CPP) psychometric from the work of Elliott Jacques. The CPP is a computer-based psychometric which profiles a person's capacity for strategic thinking. It is used worldwide in selecting and developing people for strategic roles. The 1980s also saw the widespread acceptance of positioning theory. Although the theory originated with Jack Trout in 1969, it didn’t gain wide acceptance until Al Ries and Jack Trout wrote their classic book Positioning: The Battle For Your Mind (1979). The basic premise is that a strategy should not be judged by internal company factors but by the way customers see it relative to the competition. Crafting and implementing a strategy involves creating a position in the mind of the collective consumer. Several techniques enabled the practical use of positioning theory. Perceptual mapping for example, creates visual displays of the relationships between positions. Multidimensional scaling, discriminant analysis, factor analysis and conjoint analysis are mathematical techniques used to determine the most relevant characteristics (called dimensions or factors) upon which positions should be based. Preference regression can be used to determine vectors of ideal positions and cluster analysis can identify clusters of positions. Strategic management, where widespread strategic thinking occurs and a well-defined strategic framework is used. The long-term PIMS study, started in the 1960s and lasting for 19 years, attempted to understand the Profit Impact of Marketing Strategies (PIMS), particularly the effect of market share. The initial conclusion of the study was unambiguous: the greater a company's market share, the greater their rate of profit. Market share provides economies of scale. It also provides experience curve advantages. The combined effect is increased profits. The benefits of high market share naturally led to an interest in growth strategies. The relative advantages of horizontal integration, vertical integration, diversification, franchises, mergers and acquisitions, joint ventures and organic growth were discussed. Other research indicated that a low market share strategy could still be very profitable. Schumacher (1973), Woo and Cooper (1982), Levenson (1984), and later Traverso (2002) showed how smaller niche players obtained very high returns. Author Phillip Evans said in 2014 that "Henderson's central idea was what you might call the Napoleonic idea of concentrating mass against weakness, of overwhelming the enemy. What Henderson recognized was that, in the business world, there are many phenomena which are characterized by what economists would call increasing returns -- scale, experience. The more you do of something, disproportionately the better you get. And therefore he found a logic for investing in such kinds of overwhelming mass in order to achieve competitive advantage. And that was the first introduction of essentially a military concept of strategy into the business world... It was on those two ideas, Henderson's idea of increasing returns to scale and experience, and Porter's idea of the value chain, encompassing heterogenous elements, that the whole edifice of business strategy was subsequently erected." Cameron, Bobby Thomas. (2014). Using responsive evaluation in Strategic Management.Strategic Leadership Review 4 (2), 22-27. Nag, R.; Hambrick, D. C.; Chen, M.-J (2007). "What is strategic management, really? Inductive derivation of a consensus definition of the field" (PDF). Strategic Management Journal 28 (9): 935–955. doi:10.1002/smj.615. Retrieved October 22, 2012. Ghemawat, Pankaj (Spring 2002). "Competition and Business Strategy in Historical Perspective". Business History Review (Harvard Business Review). Porter, Michael E. (1996). "What is Strategy?". Harvard Business Review (November–December 1996). Kvint, Vladimir (2009). The Global Emerging Market: Strategic Management and Economics. Routeledge. Chaffee, E. “Three models of strategy”, Academy of Management Review, vol 10, no. 1, 1985. Mintzberg, Henry (1987). "Why Organizations Need Strategy". California Management Review (Fall 1987). Mintzberg, Henry and, Quinn, James Brian (1996). The Strategy Process:Concepts, Contexts, Cases. Prentice Hall. ISBN 978-0-13-234030-4. Drucker, Peter (1954). The Practice of Management. Harper & Row. ISBN 0-06-091316-9. Henderson, Bruce (January 1, 1981). "The Concept of Strategy". Boston Consulting Group. Retrieved April 18, 2014. Mintzberg, Henry “Crafting Strategy”, Harvard Business Review, July/August 1987. Mintzberg, Henry and Quinn, J.B. The Strategy Process, Prentice-Hall, Harlow, 1988. Mintzberg, H. Ahlstrand, B. and Lampel, J. Strategy Safari : A Guided Tour Through the Wilds of Strategic Management, The Free Press, New York, 1998. Porter, Michael E. (1980). Competitive Strategy. Free Press. ISBN 0-684-84148-7. Kiechel, Walter (2010). The Lords of Strategy. Harvard Business Press. ISBN 978-1-59139-782-3. Drucker, Peter The Practice of Management, Harper and Row, New York, 1954. Selznick, Philip Leadership in Administration: A Sociological Interpretation, Row, Peterson, Evanston Il. 1957. Ansoff, Igor Corporate Strategy McGraw Hill, New York, 1965. Henderson, Bruce (1970). Perspectives on Experience. Boston Consulting Group. ISBN 0-684-84148-7. Porter, Michael E. (1985). Competitive Advantage. Free Press. ISBN 0-684-84146-0. Hamel, G. & Prahalad, C.K. “The Core Competence of the Corporation”, Harvard Business Review, May–June 1990. Drucker, Peter F. (1994). "The Theory of the Business". Harvard Business Review (September–October 1994). Beaufre, Andre (1965). An Introduction to Strategy. Translated by R.H. Barry. With a pref, by B.H. Liddell Hart. Frederick A. Prager. OCLC 537817. Unknown ID 65-14177. Mulcaster, W.R. "Three Strategic Frameworks," Business Strategy Series, Vol 10, No1, pp68 – 75, 2009. Scwhartz, Peter The Art of the Long View, Doubleday, New York, 1991. Wack, Pierre “Scenarios: Uncharted Waters Ahead”, Harvard Business review, September October 1985. Elcock, Howard, "Strategic Management," in Farnham, D. and S. Horton (eds. ), Managing the New Public Services, 2nd Edition, New York: Macmillan, 1996, p. 56. Hamel, Gary Leading the Revolution, Plume (Penguin Books), New York, 2002. Moore, Mark H., Creating Public Value: Strategic Management in Government, Cambridge: Harvard University Press, 1995. Senge, PeterThe Fifth Discipline, Doubleday, New York, 1990; (also Century, London, 1990). Drucker, Peter The Age of Discontinuity, Heinemann, London, 1969 (also Harper and Row, New York, 1968). Toffler, Alvin Future Shock, Bantom Books, New York, 1970. Toffler, Alvin The Third Wave, Bantom Books, New York, 1980. Abell, Derek “Strategic windows”, Journal of Marketing, Vol 42, pg 21–28, July 1978. Tichy, Noel Managing Strategic Change: Technical, political, and cultural dynamics, John Wiley & Sons, New York, 1983. Handy, Charles The Age of Unreason, Hutchinson, London, 1989. Pascale, Richard Managing on the Edge, Simon and Schuster, New York, 1990. Slywotzky, Adrian Value Migration, Harvard Business School Press, Boston, 1996. Christensen, Clayton "The Innovator's Dilemma," Harvard Business School Press, Boston, 1997. Markides, Constantinos “A dynamic view of strategy” Sloan Management Review, vol 40, spring 1999, pp55–63. Moncrieff, J. “Is strategy making a difference?” Long Range Planning Review, vol 32, no2, pp273–276. "Taking Care of Business, 1995–2005". ScienceWatch. Thomson Scientific. November–December 2005. Retrieved 2012-01-26. Deming, W.E. Quality, Productivity, and Competitive Position, MIT Center for Advanced Engineering, Cambridge Mass., 1982. Juran, J.M. Juran on Quality, Free Press, New York, 1992. Kearney, A.T. Total Quality Management: A business process perspective, Kearney Pree Inc, 1992. Crosby, P. Quality is Free, McGraw Hill, New York, 1979. Feignbaum, A. Total Quality Control, 3rd edition, McGraw Hill, Maidenhead, 1990. Heskett, J. Managing in the Service Economy, Harvard Business School Press, Boston, 1986. Davidow, W. and Uttal, B. Total Customer Service, Harper Perennial Books, New York, 1990. Schlesinger, L. and Heskett, J. "Customer Satisfaction is rooted in Employee Satisfaction," Harvard Business Review, November–December 1991. Berry, L. On Great Service, Free Press, New York, 1995. Kingman-Brundage, J. “Service Mapping” pp 148–163 In Scheuing, E. and Christopher, W. (eds. ), The Service Quality Handbook, Amacon, New York, 1993. Sewell, C. and Brown, P. Customers for Life, Doubleday Currency, New York, 1990. Reichheld, F. The Loyalty Effect, Harvard Business School Press, Boston, 1996. Gronroos, C. “From marketing mix to relationship marketing: towards a paradigm shift in marketing”, Management Decision, Vol. 32, No. 2, pp 4–32, 1994. Reichheld, F. and Sasser, E. “Zero defects: Quality comes to services”, Harvard Business Review, September/October 1990. Hammer, M. and Champy, J. Reengineering the Corporation, Harper Business, New York, 1993. Lester, R. Made in America, MIT Commission on Industrial Productivity, Boston, 1989. Camp, R. Benchmarking: The search for industry best practices that lead to superior performance, American Society for Quality Control, Quality Press, Milwaukee, Wis., 1989. Rumelt, Richard P. (2011). Good Strategy/Bad Strategy. Crown Business. ISBN 978-0-307-88623-1. Barnard, Chester The function of the executive, Harvard University Press, Cambridge Mass, 1938, page 235. Mintzberg, Henry The Nature of Managerial Work, Harper and Roe, New York, 1973, page 38. Kotter, John The general manager, Free Press, New York, 1982. Isenberg, Daniel “How managers think”, Harvard Business Review, November–December 1984. Isenberg, Daniel Strategic Opportunism: Managing under uncertainty, Harvard Graduate School of Business, Working paper 9-786-020, Boston, January 1986. Zaleznik, Abraham “Managers and Leaders: Are they different?”, Harvard Business Review, May–June 1977. Zaleznik, Abraham The Managerial Mistique, Harper and Row, New York, 1989. Corner, P. Kinicki, A. and Keats, B. “Integrating organizational and individual information processing perspectives on choice”, Organizational Science, vol. 3, 1994. J. Scott Armstrong and Kesten C. Greene (2007). "Competitor-oriented Objectives: The Myth of Market Share". International Journal of Business 12 (1): 116–134. ISSN 1083-4346. Barney, J. (1991) “Firm Resources and Sustainable Competitive Advantage”, Journal of Management, vol 17, no 1, 1991. Pine, J. and Gilmore, J. “The Four Faces of Mass Customization”, Harvard Business Review, Vol 75, No 1, Jan–Feb 1997. Evens, P. and Wurster, T. “Strategy and the New Economics of Information”, Harvard Business Review, Sept/Oct 1997. Schuck, Gloria “Intelligent Workers: A new pedagogy for the high tech workplace”, Organizational Dynamics, Autumn 1985. Zuboff, Shoshana In the Age of the Smart Machine, Basic Books, New York, 1988. Buzzell, R. and Gale, B. The PIMS Principles: Linking Strategy to Performance, Free Press, New York, 1987. Woo, C. and Cooper, A. “The surprising case for low market share”, Harvard Business Review, November–December 1982, pg 106–113. Levinson, J.C. Guerrilla Marketing, Secrets for making big profits from your small business, Houghton Muffin Co. New York, 1984, ISBN 0-618-78591-4. Traverso, D. Outsmarting Goliath, Bloomberg Press, Princeton, 2000. Moore, J. “Predators and Prey”, Harvard Business Review, Vol. 71, May–June, pp 75–86, 1993. Collins, James and Porras, Jerry Built to Last, Harper Books, New York, 1994.
de Geus, Arie (1997). The Living Company. Harvard Business School Press. ISBN 978-0-87584-782-5. Mulcaster, W.R. "Three Strategic Frameworks," Business Strategy Series, Vol 10, No 1, pp 68 – 75, 2009. This page was last modified on 4 January 2015 at 16:30.